Practical and stylish in their own way – chunky and yet somehow sleek – dive (or diver) watches have been one of the leading styles in men’s watches for almost 70 years. However, first and foremost, dive watches are all about functionality – you wouldn’t want to pay often hefty price for the best dive watches unless you’re planning on using it deep underwater. I have a policy that I try to follow wherever possible. Buy Once – Buy right. It is no different when it comes to the gear I take with me on dives. In this article, we will take a look at 5 of the best dive watches on the market and what you need to look for before making a purchase. Generally speaking, the more you pay for a dive watch, the deeper the max depth. That’s not to say you should go for a watch with a 2,000m rating just because it looks cool. What I advise is that you consider your own skills and experience and the depths you are likely to dive too. If you regularly dive at say 200m then perhaps a watch that covers you to 300-500 meters would be fine. All that matters is that you get a device with sufficient coverage should you wish to go deeper. There is nothing worse than paying upwards of $500 for a dive watch, only to have it bust on you because you maxed out the depth capacity. There are two elements to look at when it comes to the watch material. This is persona preference, however, most of the best models, as you will see from the dive watch reviews below, are made with a silicone rubber. This is so that the strap doesn’t absorb water and it resistant to abrasion, which greatly increases the lifespan of the watch itself. This is important. I have no doubt that you will, many times, knock, graze and bang your watch. It’s a natural occurrence with diving, boats, water and heavy gear. So you need to ensure you choose a strong outer casing that will protect the inner workings from damage. My personal preference is Titanium for a few reasons. Namely, it’s superior strength and resistance to scratching and also it is super lightweight. It’s used on many of the top rated dive watches and for good reason. It is the best watch housing material period. Another one that will depend on your personal usage and preference. Some like a watch to have all kind of features, buttons and added extras to help train and improve their diving. Whilst others simply want to know the time. Of course, there are many, many more features you can get on a dive watch, especially the digital ones. The often come with a great deal of bells and whistles – in addition to a number of necessary standard features – it can be tricky to differentiate which watches are worth $200 and which watches are worth $2,000. Nevertheless, no matter the caliber or quality of watch you’re looking for, there are a few standard features you should look for. Depending on what you value, each of these features could or could not be indispensable; however, you should generally be looking for watches that offer them. Big Markers and Hands: Deep underwater, you probably won’t be able to see very well. You’ll need big hands that are easy to find. Glow-in-the-Dark Watch Face: Similarly, it’s probably going to be very dark deep underwater, so some glow-in-the-dark material is pretty essential. Rotating Bezel (preferably external): Arguably the most distinctive element of the best dive watches, the rotating bezel will tell you how much time has elapsed since you’ve been underwater. A typical scuba tank holds 30 to 50 minutes worth of oxygen. Now that we’ve nailed down the basics, we’ll explore some of the best dive watches on the market today. Dive watches fluctuate wildly in price, so we’ve included some from each range, whether or not you’re looking to pay top dollar. Seiko makes some of the worlds best dive watches and the Prospex MarineMaster is one of those. With a silicone strap and titanium housing, this is one durable and lightweight watch. What strikes us first is the awesome color scheme and the illuminated second hand. The MarineMater has a unidirectional bezel and is a watch for serious divers, with its 1000m depth capabilities, you can take this watch anywhere and it won’t let you down. The Prospex Marinemaster Pro comes out top of our dive watches under $2,000 thanks to it’s crisp and comfortable design and subtle yet powerful features that will add another element to your diving experience. The watch will not look out of place in an everyday environment when your not in the water, meaning this in an all-around watch with serious dive capabilities. The Lowdown: Now we’re getting to the high-end models. The Reactor Poseidon TI handles scuba diving better than any other watch on the list, as it’s water resistant up to 1000 meters, a full 800 more than any other watch on that list. Just from a pure functionality standpoint, that places the Reactor Poseidon TI stands above the best dive watches on the market. Other than the water resistance, the Reactor Poseidon boasts all of the standard features, with one exception: dual external and internal bezels, meaning you can keep track of two times at once. Stylistically, the Poseidon TI is designed to look more or less like a normal silver watch – if it weren’t for its size, you’d have to look twice to realize it’s a dive watch. Ultimately, if performance matters more to you than anything else, and if you have the means, the Poseidon TI is one of the gold standards of the industry. The Lowdown: Although it’s quite difficult to compete with the Reactor Poseidon LE in the “Rolls Royce” dive watch category, the Oris Divers Sixty-Five puts up a good fight. A revival of a classic Oris model that first appeared 50 years ago more or less (1965), the Oris Sixty-Five is a throwback in every sense of the word. The vintage black and gold stylings are about as sleek as it gets, and this is perhaps the best “classic” looking dive watch on the market today. If aesthetics are really important to you, look no further. 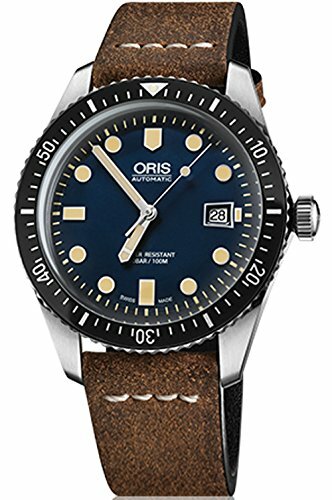 The Oris also boasts solid functionality. It has all of the necessary basic features of a dive watch, with a few durability upgrades – anti-corrosive stainless steel and scratch-resistant sapphire crystal add a 21st century update to this classic. An anti-reflective coating also makes it easy to read the watch underground, and the bubble casing helps maintain its classic look. When I saw the price on this watch I was shocked, I was expecting at least another $300-$400 on the price tag, but it is certainly sub-$1,000 and then some! This sunlight-powered Eco-Drive dive watch, with a max depth of 200m, not only looks the part but it scores high on our editor rating with a whopping 4.8 out of 5 stars. If you’re looking for a comfortable dive watch with good depth and a solid build, then the Citizen Promaster could be the one for you. It’s certainly a leader in its price range, with its unidirectional bezel, colorful hands, which include a luminous seconds hand, and date window, not to mention the 53 mm stainless steel casing and high-end Japanese quartz movement. Another watch from an easily recognized brand. Tissot makes some amazing luxury watches and they didn’t disappoint in the dive watch arena too with the Seastar 1000. This watch is capable of depths down to 300 meters, which is mid-range of the watches reviewed here today, and is constructed in the USA, and protected by a 45 mm thick stainless steel housing. 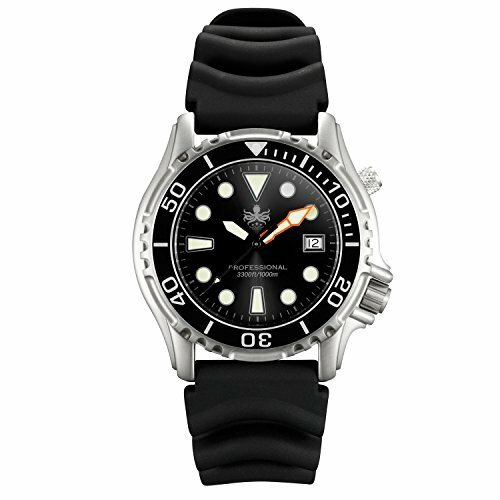 Comfort is the often cited key feature of the Seastar, with its black silicone band and buckle and contrasting silver case. If you are looking for a dive watch from a brand you know and trust, then the Tissot has to be the one. The Seastar 1000 has received rave reviews from the community and for good reason. It has ample water resistance to 300m, luminous hands and marker points and date window. 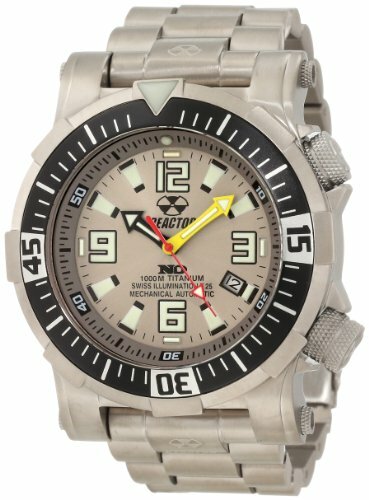 This watch is suitable for being in the water or on dry land since it’s design ensures it fits in with any environment. 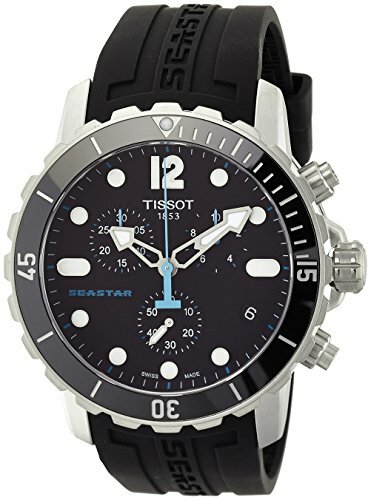 So if you are looking for a watch for everyday use the Tissot Seastar 1000 is the one. 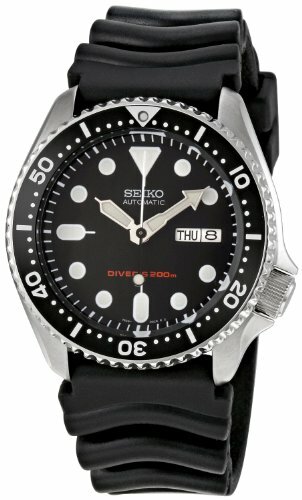 Another entry from Seiko, this time in the sub $300 range. The SKX173 is an Eco-Drive automatic wind watch that is powered by sunlight, meaning you will never have to change the battery. With a 200m max depth and a casing made from stainless steel, you have a watch that is capable of being used and abused and standing up to whatever you can throw at it. The Seiko SKX173 is one of the most popular watches reviewed here today thanks to its superior build quality and great price. You will be hard pressed to find a watch better in this price range. One of the best selling features of this watch are the bright illuminating hands which make it easy to use in the dark or when you are at depth. The Phoibos PX005c is probably one of the best prices to max depth ratio watches on this entire list. With a water resistant rating down to 1,000m you really cannot go wrong with the hidden gem. With a Swiss quartz movement, illuminating hands and a helium release valve, this watch certainly packs a punch. We all like an underdog, especially one that comes out swinging and that is certainly what Phoibos has done with this watch. The design is neat and uncluttered, so for those looking for something a little cleaner and simple, not too bright and flashy, this is right up your street. 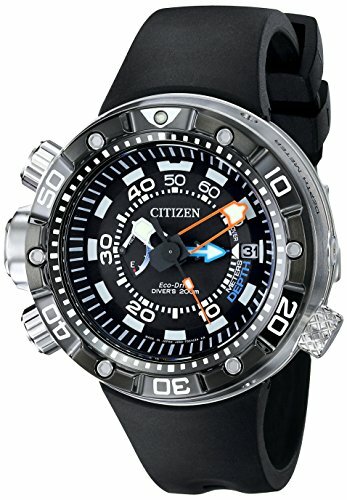 The Lowdown: Extremely popular on Amazon, the Citizen Promaster Professional Diver Watch is just about the best budget dive watch on the market, if you’re not looking to do extremely serious scuba diving. Perfect for both professional marine activity and serious water sports, the Citizen Professional is a very attractive, classic, well-built dive watch, boasting supreme luminosity and an excellent Japanese quartz movement construction. Perhaps the Citizen Professional’s best feature is its Eco-Drive charging technology. Completely light-fueled, the Citizen Professional never needs a battery, and if it’s been in the light for a while, it will glow for hours underwater. The Citizen Professional’s only drawback is that it can’t handle scuba diving. Nevertheless, for just about any other water function, it’s pretty close to perfect. 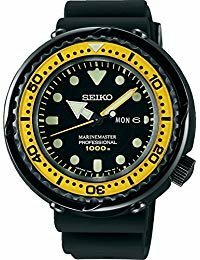 The Lowdown: As the least expensive watch on this list, the Seiko Diver Automatic has garnered praise from a number of reviewers for its high “cost to value” ratio. It’s certainly a good looking watch, and as it’s water resistant up to a depth of 100 meters, it’s not quite as natural in the water as the Citizen Professional, but it gets the job done. It runs perfectly, is reliable, and its size is impressive. Overall, it’s a watch that will get you a lot of compliments. A few drawbacks – this Seiko model tends to run about 25 seconds fast every day, the luminescence doesn’t last very long, and some say that the strap can be a bit uncomfortable. 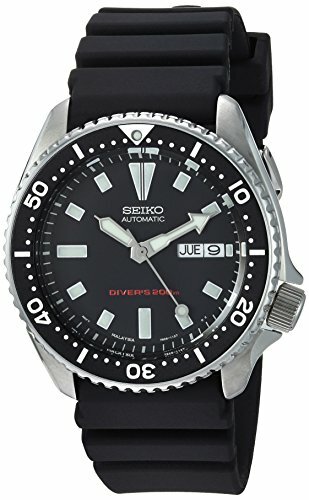 Nevertheless, the Seiko Diver Automatic is just about the cheapest “good” dive watch on the market, so if you’re looking to spend as little money as possible, you’ll still get a great deal of value if you choose this Seiko model. Last but by no means least we have an entry from Invicta, a company that is growing in popularity in the dive world thanks to its fantastic price and great build quality. 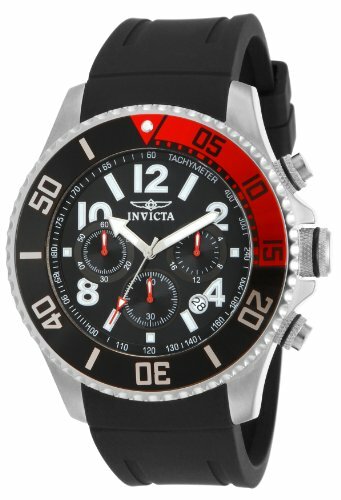 This striking design is the Invicta Pro Diver and has a max depth of 100m. Despite the sub $100 price tag, the Pro Diver does have many of the features you’d expect from a more expensive diver watch. Including a date window, moveable bezel and a Japanese quartz movement are all the features you need for top-quality watersports watch. Whilst not all singing, all-dancing like some of the other dive watches reviewed in this article, the Invicta can and does holds it’s own and comes out on top of its price category. If you’re looking for a stylish watch with decent depth rating and comfortable design, you should consider the Pro Diver.